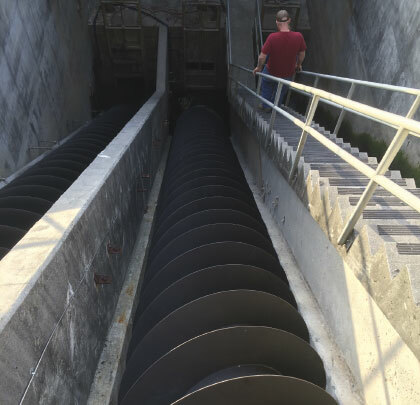 With almost thirty years and counting of uninterrupted service for its 60-inch and 72-inch screw pumps, operators at the City of Calhoun’s Wastewater Treatment Plant have firmly underlined the benefits of basic preventive maintenance. In 1988, Calhoun’s WWTP (permitted for 16 million gallons per day) first invested in two of Lakeside Equipment Corporation’s 60-inch, 75 horsepower open screw pumps (capacity of 7,000 gallons per minute), and two 72-inch, 50 horsepower screw pumps (capacity of 10,500 gallons per minute). Original concrete construction involved an empty space provided for a third pump for each capacity, which was filled in 2012 by a new 60-inch, 75 horsepower Lakeside screw pump with a lift of 20.46 feet at 38-degree incline. A year later in 2013, one of the original 60-inch Lakeside pumps was finally replaced (followed a year later by another of the same diameter to replace the last, original 60-inch screw pump)—but even then, as John Banks, the City of Calhoun Wastewater Treatment Plant’s manager, explains, this was more to do with budgetary and long-term planning requirements. The average flow at Calhoun (one hour north of Atlanta), is around 5 million gallons per day (14 to 16 million gallons per day during rain events), serving the city of Calhoun, Georgia (home to some of the world’s top floor covering manufacturers). The treatment plant is a tough, corrosive environment for the original Open Screw Pumps (all Lakeside), that via three different configurations, run rotationally 24/7 to equal out wear. Consisting of a spiral screw, upper and lower bearings, and a drive arrangement, the open screw design uses a torque tube with spiral flights set in an open, inclined concrete trough. 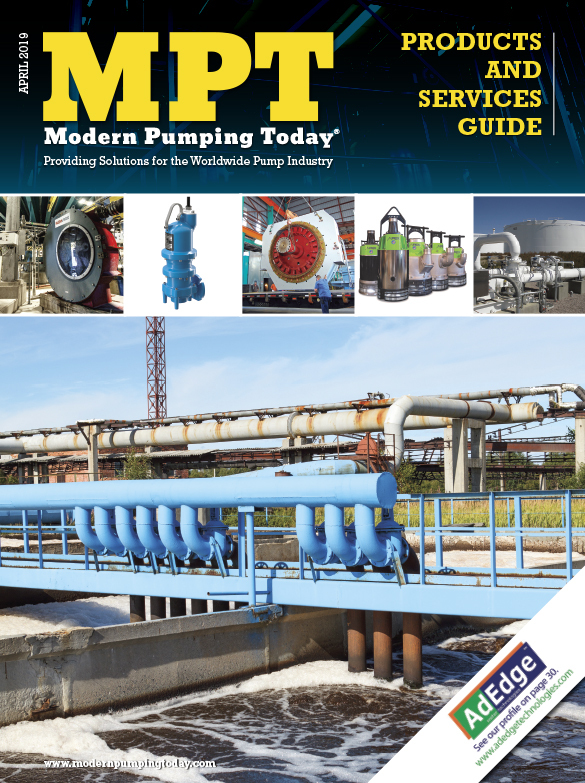 The screw pump’s basic design has been used for millennia to promote both simplicity and reliability. Normally, two of the Lakeside screw pumps at the influent of Calhoun’s WWTP lift the raw sewage up out of the collection system into the plant. Pre-screening is not required because large objects pass between the screw flights and through the screw pump. 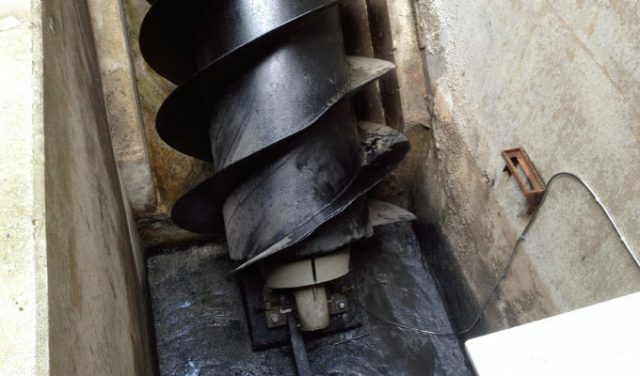 Additional screw pumps are ready in the event of the sewer system becoming supercharged due to a large rain event. 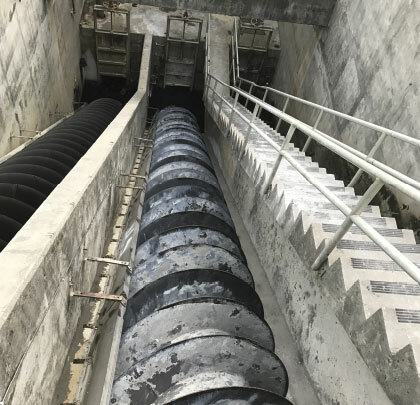 After lifting, the wastewater is taken through screening and grit removal processes before being lifted again by a second set of screw pumps. The older portion of the Calhoun system covers over 136 miles of interceptor and trunk lines through the city. It was upgraded in 2004 to meet new standards. Then, as now, the purchase of screw pumps was put out to bid, with an eye on securing the best in long-term performance and value. Lakeside offers both greased and sealed lower bearings on their open screw pumps. The dual upper bearing of each style pump includes both radial and thrust components, serving both forces that act upon it, which helps prolong the lifetime of the screw pump. The pump also benefits from a V-belt drive that connects the motor to the speed reducer. This acts as a shock absorber to protect from possible shock loads, as well as provide for easy speed changes in the field. 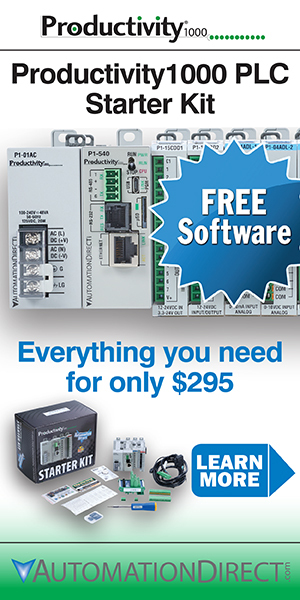 The constant speed drives eliminate the need for complex, variable speed electrical controls. John Banks concludes, “We’ve taken care of our screw pump installations, but Lakeside are always there to help with start-up, and service if required. They’re a company that very much stands by its equipment, and like us, thinks about the long term. We’ve also had good support from Lakeside’s representative Templeton and Associates, based in Suwanee, Georgia.